I suppose this is the natural conclusion of my stairs research, and perhaps some of you could see it coming. Can be placed anywhere, no restrictions on placement. There is no "front" or "back" or even "side" to this object. 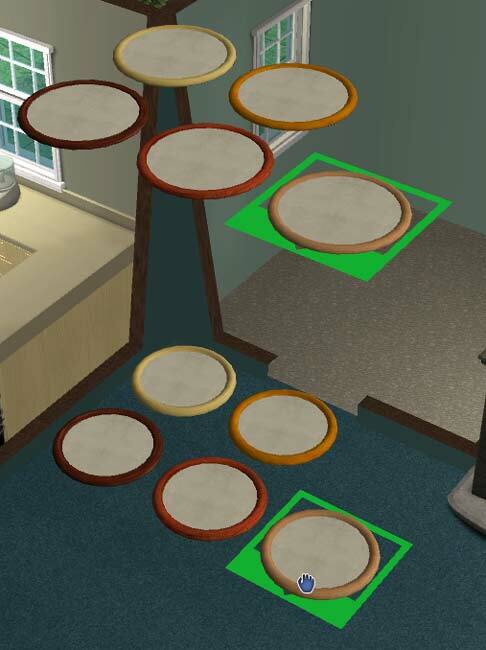 You can block any three of the cardinal directions with objects or walls, and block any different three on the upper story, and the Sim can still use it. As you can see from the second screenshot, it truly takes up only a single tile. Stacks vertically. I made the upper "disc" slightly smaller than the lower disc. What this means for you is that when you stack them, the smaller upper disc is hidden inside the new bottom disc, for a nice, clean appearance. This was made from the StareStepper staircase, and retains the availability of all 5 original colors (though the center stays white). Maxis original stairs had over 4,000 faces. Another interesting feature of this is that the "teleportation point" is dead-center, so when you stack them and tell a Sim to go up say...5 floors, they instantly teleport right to the top, without any pauses at each floor. Very quickly! It's amusing to see. Anyhoo....I hope you find this super spacesaver "staircase" a useful addition to your custom object collection.